This recipe combines two Indian classics: lentil dal and saag paneer. 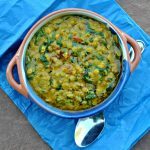 The spinach from saag paneer (without the cheesy cubes of paneer) is paired with a protein-rich lentil dal in a creamy coconut sauce. Combine the lentils in a large saucepan with 3 cups of water. Bring to a boil. Decrease the heat to low, add the turmeric, and simmer partially covered for 30 minutes, stirring occasionally. Uncover and continue to simmer until the lentils are soft and the liquid is absorbed, about 15 minutes. While the lentils are cooking, heat the oil or water in a medium skillet over medium heat. Add the onion, cover, and cook until softened, about 5 minutes. Add the garlic, ginger, and chile, and cook until fragrant, about 30 seconds. Add the cumin, coriander, garam masala, cardamom, if using, and tomatoes, stirring constantly for about 30 seconds longer. Stir in the spinach, coconut milk, and cilantro and simmer for 5 minutes. Add the spinach mixture to the lentils and stir well to combine. Taste to adjust the seasonings, if needed. Serve hot.